Earlier today it was announced that the Detroit Red Wings will be having a press conference tomorrow at Joe Louis Arena, where General Manager, Ken Holland, and Nick Lidstrom will speak. At the conclusion of last season Lidstrom had considered retirement, only to announce that he would return for another season and sign a one year contract with the Red Wings. Lidstrom made this announcement via conference call and not a press conference, uh-oh. The fact that the Wings will be having a presser and both Holland and Lidstrom will be there gives off the feeling that the Lidstrom era has come to an end, and tomorrow may be his formal good-bye. 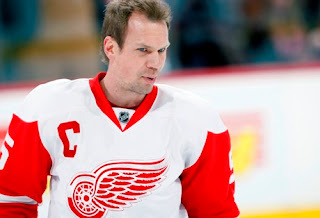 Lidstrom has played all 1,564 games of his career with the Red Wings and has been the captain of the Original Six franchise for the last six seasons. Over the years, Lidstrom has won four Stanley Cup Championships and has seven Norris Trophies, dubbing him the leagues best defenseman. Of course, this is all just speculation, and this press conference could be to announce Lidstrom's return for yet another season. Personally, I don't want to see him go, the guy is still to dominant at what he does and to hang up the skates would be just wrong. I'm sure every Detroit fan feels the same way. If Lidstrom does in fact retire tomorrow morning the game will be sending off, perhaps the best defenseman the NHL has ever seen.